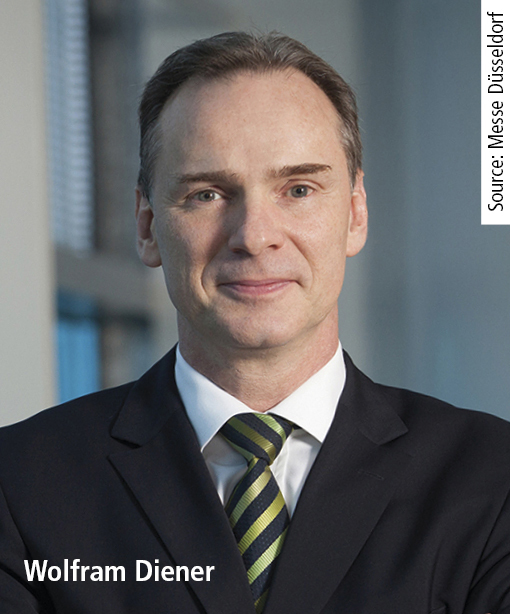 Wolfram Diener, 54, currently active as Senior Vice President at UBM Asia Ltd. in Hong Kong, will become the new operative managing director of Messe Düsseldorf GmbH, effective from 1 October 2018. He succeeds Joachim Schäfer, 64, who will retire from the company at the end of August 2018. Diener will take over the divisions that Schäfer has been responsible for since 2006: the Global Portfolios Health and Medical Technologies (Medica, Compamed, Rehacare International) and Metals and Flow Technologies (Gifa, Thermprocess, Newcast, Pump Summit, Valve World Expo, Metec, wire, Tube), the trade fair trio Beauty Düsseldorf, Top Hair – Die Messe with the make-up artist design show, A+A – Safety, Health and Security at Work, glasstec as well as the trade fair duo Caravan Salon Düsseldorf/TourNatur.